AUGUSTA — A man who robbed two pharmacies the same day at opposite ends of Kennebec County and another three days later will spend the next 15 years behind bars. 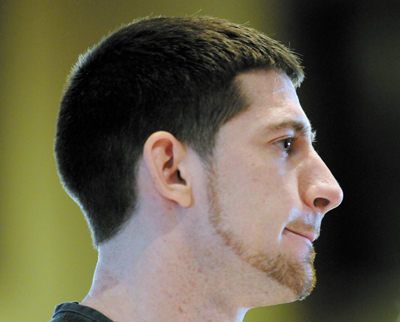 Shawn M. Merrill, 27, of Augusta was sentenced Monday in Kennebec County Superior Court on 16 offenses, some of which date to 2010, when he robbed an attendant at J&S Oil gas station and convenience store in Augusta. Staff photo by Andy Molloy PLEA: Shawn Merrill plead guilty to several pharmacy robberies Monday at Kennebec County Superior Court in Augusta. The complete sentence imposed by Justice Nancy Mills was 25 years in prison, with all but 15 years suspended, and five years of probation. “Based on this record, my concern now is for the people of the state of Maine, not for Mr. Merrill,” Mills said. On Monday, Merrill pleaded guilty to robbing pharmacies in two stores — Goggins IGA in Randolph and Waterville Walmart — on June 12, and the Rite-Aid pharmacy in Fairfield on June 15. Merrill demanded Oxycodone at all the pharmacies and indicated in a note and sometimes also verbally that he had a gun. Police say Merrill also confessed to two other pharmacy robberies in Connecticut.